The first fixture of the fourth day of the Delhi leg sees finalists of last season, Gujarat Fortune Giants and Patna Pirates, go head-to-head for the first time in PKL 2018. Both teams are currently second in their respective zones and would be keen to get a win to work towards the top again. 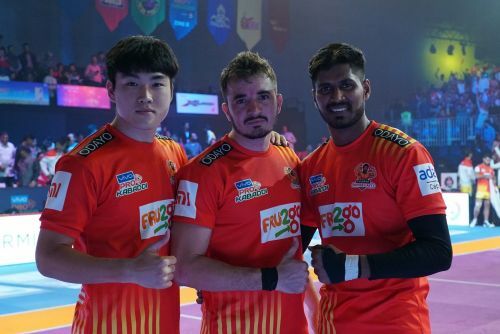 Gujarat will go into the encounter at the Thyagaraj Sports Complex in New Delhi on the back of a disappointing loss to U Mumba, a team they had never lost to before in their entire history in the league. Despite eight points from Sachin Tawar and three points from left cover Parvesh Bhainswal, the Fortune Giants could not put in a solid enough performance to give themselves a chance to win. Though it was only their third loss this season, they would want to bounce back from that and what better time to do it than against the team that defeated them in the final in season five. The Pirates come into this encounter on the back of a five-game unbeaten run that includes four wins and a tie. They have propelled themselves to second position in Zone B PKL Points Table on the back of their recent results and would want to continue their surge. The last time these two sides met, Patna Pirates overcame the Gujarat Fortune Giants in a comfortable manner, winning 55-38, with Pardeep Narwal starring with 19 raid points. This time too, Pardeep will be the key man for his team, having already scored 157 points in 14 matches this season. Known to be one of the most dangerous raiders in the history of the league, he is the only player to have won the Most Valuable Player award for two successive seasons (four and five). His biggest challenge from the Fortune Giants' side will be Bhainswal, who has used his discipline and timing to great effect and become probably the best cover defender in the league with 56 points, five more than his cousin and team captain Sunil Kumar. They have the most tackle points as a duo in the league, more than any cover or corner pairing, making them the biggest assets of the team from Gujarat. Considering the threat posed by Narwal, it is safe to assume that his former captain and now coach of the Fortune Giants, Manpreet Singh, will definitely have hatched a plan to enable his team to get the advantage and take revenge for Gujarat's loss in the finals of season five. Sachin will be the lead raider for the Gujarat Fortune Giants and with 118 points in 15 matches, he has shown himself to be able to bear the load needed for his team to secure the win. Averaging almost eight raid points per game, he will have to contend with the prolific point-scoring defender, Jaideep of the Patna Pirates. The left corner, who has scored 48 points in 15 matches and is seventh on the list of defenders with most tackle points this season, will have to be alert throughout the game to help his team get the win and add to their recent unbeaten streak. With a cracker of an encounter on the cards, it remains to be seen if Patna Pirates can repeat their win from last season's final or if the Gujarat Fortune Giants have finally figured out how to stop the juggernaut that is Pardeep Narwal to clinch the win.